Often a Taylor Dunn utility cart will be used to haul a heavy load. Because of the stress placed on the batteries, we only recommend the high capacity deep cycle batteries with a 260 ah rating. Frequent battery charging is necessary to maintain the life of your deep cycle batteries. The taylor dunn battery charger may be on-board or portable and will only perform one charge cycle before turning off, even if the charger is left plugged in. The OE charger will not maintain the battery pack voltage indefinitely. 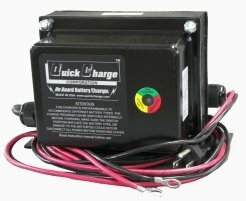 Quick Charge does make a battery charger that will also maintain the battery pack and we stock them for that reason. 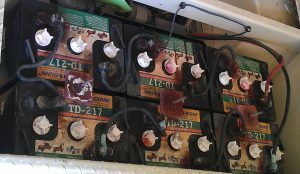 Note the Taylor Dunn battery cables in the image need to be replaced due to corrosion. 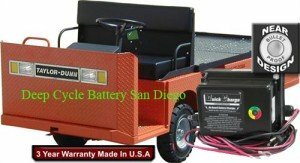 The 36 volt utility cart carries the batteries in the bed of the cart and are easy to access for monthly battery maintenance. Only distilled water should be used to refill the batteries. The Trojan T-145 6 Volt Deep Cycle Battery with 260 ah has three independent caps with a hing for access. The battery terminal is a single 5/16 stainless steel stud. A carry strap sold for $5 is used to remove and install the Taylor Dunn Batteries. 4 gauge or even 2 gauge welding cable is recommended if using the Taylor Dunn utility cart for heavy hauling. The Crown CRGC150 is a very robust 6 volt 260 ah battery with single caps for water access. Only distilled water should be used for refilling. Due to the heavy nature of the Crown battery plate, a 15 amp or higher battery charger by Lester or Quick Charge is recommended. Avoid high frequency chargers like Delta Q. With the stress of heavy hauling, it is advised to use 600 volt 2 AWG welding cable for the battery connectors. It is available at our shop. 36 Volt On Board Chargers made in the USA by Quick Charge are designed to travel with the cart and can be plugged into any 110AC outlet available. The Taylor Dunn charger has a green, amber and red light indicator to identify the batteries current state of charge. 25 amps means the batteries will recharge faster than 15 amp charger models. 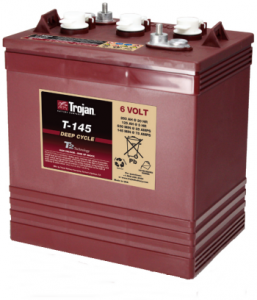 Deep cycle batteries designed for utility carts need to be charged with high constant current. Too many high frequency or switch mode chargers will not get the job done before they heat up and shut off prematurely.